I settle into my nursing chair, breast-feeding pillow comfortably on my lap, feet up on the ottoman and lay A. down on the pillow. “Would you like some mommy milk?” She eagerly begins to nurse then looks up at me with her big blue eyes and reaches her hand up for mine. The love hormones wash over me in this moment. It is wonderful! This is what I waited for. Prior to A.’s birth I did a lot of preparation, especially when it came to breastfeeding. My husband and I attended a prenatal class that had a session devoted specifically to breastfeeding, we attended our local community breastfeeding class, I read this book on breastfeeding, and I observed (during our required hours of observation for our training) many women breastfeeding to know a proper latch. Having a few friends who were unable to breastfeed (due to different circumstances), I knew that despite the preparation I did, breastfeeding itself might not work out. So while my preparation helped me to feel ready for the mechanics of breastfeeding, my Montessori training had prepared me to focus on the relationship with my daughter during feeding, breast or bottle. It was important to me to focus on the relationship with my daughter that would unfold as I fed her. While I feel that breast milk is the best food for an infant, breastfeeding is not about the food itself. Feeding her was also about nourishing her psychological needs. Feeding my daughter provided me an opportunity to bond with her that no other situation would offer us. It is an intimate time for the two of us to share. During her first few weeks I fed her skin to skin as we got to know one another. She was able to get to know my smell, be close to my familiar heartbeat that she heard while in-utero, feel my warmth, and be close to hear my voice. We were able to examine each other’s faces, staring into the eyes we had been waiting to meet for nine months. The first couple of months, the symbiotic period, was an essential time in our relationship to bond with each other. By the end of the symbiotic period, I knew we had a strong, trusting, loving bond together and attribute much to our time spent as I nursed her. If the child is deprived of a mother who is fully present while eating, he/she will not be able to gain a full understanding of a relationship with another human being. The relationship with the mother is the child’s first relationship and it sets the stage for all other relationships. If all we offer is food and not our full attention, our full love, our desire to get to know this other human being – then relationship will only have empty meaning to a child. Relationship will be about the mechanics, not the warmth of intimacy. Those first few months with A. were so special. I was so excited to be a new mother that I fully devoted my attention to A. while feeding her. I was present with her in mind, body, and soul. But then came the book with the information I was craving to get through a challenging part of motherhood and I couldn’t put the book down. And the text that came flashing in so I continued the conversation while feeding A. I checked my e-mail in the morning to ensure there were no pressing matters to deal with for my school. I justified this thinking “she’s so focused on eating, she’s not paying attention to me”, “it’s just for a moment, then I’ll turn my attention back to her”, and thinking that other things were more important than spending quality, uninterrupted time with my daughter while feeding her. I hesitated to write this post as I don’t want to be hypocritical. But having the intellectual knowledge, the emotional understanding and desire to do things, and carrying it out in reality can sometimes be very challenging. A few months ago A.’s weight gain was minimal, not in a concerning manner but in a ‘let’s keep an eye on it’ manner. I immediately went into protective mommy role: “Am I doing all that I can to provide for my daughter?” I thought back to the hormones involved in breastfeeding. I thought that perhaps if I wasn’t fully engaged in the moment with A., how could my body be deeply connecting to this experience? I took the books away from my nursing side table. I stopped bringing my phone to the nursing chair. I remembered to be fully in the moment with A. I started holding her with both hands to be more engaged with her while she ate. I let our eyes deeply meet again throughout the entire feed. I don’t know if this made a difference to her weight gain, but it helped me re-focus on all of A.’s needs: food for physical development and my loving, fully-engaged presence for her psychological development. A special note regarding bottle feeding. The question arose during our prenatal class for myself who was worried that I would not be able to breastfeed and for those that were choosing not to breastfeed: Is it possible to have the same psychological connection with your baby using a bottle? Our instructor was wonderful in encouraging us to simulate many of the same scenarios. 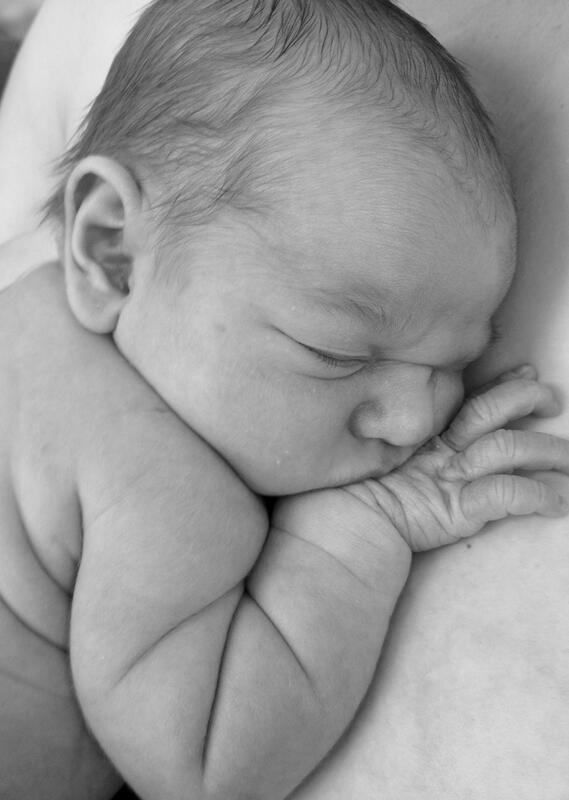 Feed your newborn with skin-to-skin contact. Have the mother exclusively feed the newborn for the first couple of months (symbiotic period) to establish their relationship (or at least limit others feeding the newborn during this time period). Hold the baby in a similar manner to breastfeeding, switching sides for each bottle feeding. Set aside all distractions so you can focus on your newborn. If the father or other caregivers are feeding then it is important that they too spend uninterrupted, focused time with the baby while feeding. 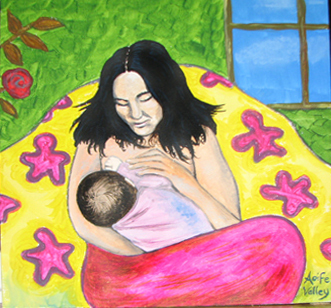 The relationship of feeding can be deep, wonderful, and intimate if you bottle feed or breastfeed. This deeply touched me. Thanks for posting this…I needed to read this. Weight gain is a concern for us as well. I am now inspired to change my texting, FBing, and surfing ways. Thanks for commenting! This was a difficult one to write but I felt strongly that I should write it. I’m glad it has helped you. I did other things to encourage weight gain as well so please let me know if you would like further advice. Weight gain is no longer a concern for us. Gee thanks! I welcome any advice I can get on the Subject. I loved reading this. Thank you for writing and sharing it. I clicked to find the article that discusses the negative effects of texting while breastfeeding, but was unable to find it. Might you be able to post or email it?